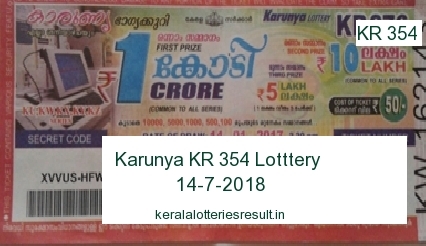 Kerala Lottery 14.7.2018 Karunya Lottery Result KR 354 draw held today. The Karunya lottery result will be published on this web site www.keralalotteriesresult.in after 3.30pm. The ticket holders of Kerala lottery Karunya KR 354 an check the Todays Kerala lottery winning numbers from this web site. Karunya Lottery Result 14.07.2018 : Karunya Lottery is a weekly lottery conducted by Kerala State Government on every Saturday. Kerala Lottery Karunya Result and all other Kerala lotteries results are publishing on www.keralalotteriesresult.in Karunya Lottery Result draw published on every Saturday after 3:00 PM.